Half of Jefferson County, Kentucky, children lack the basic skills and knowledge to begin kindergarten. The PNC Foundation, Lift A Life Foundation, National Center for Families Learning (NCFL), Metro United Way’s Ready for K Alliance, and Louisville Metro recently announced a more than $250,000 collaboration to support Say & Play with Words, a new pre-Kindergarten vocabulary-building initiative. Say & Play with Words will target at-risk children in Louisville neighborhoods, with a goal of shrinking the word gap and increasing kindergarten readiness. By age 4, low-income children are exposed to 30 million fewer words than children from high-income families. Testing showed a child’s vocabulary use at age 3 predicted their vocabulary and reading skills in third grade. First grade vocabulary measurement predicts about a third of reading comprehension in 11th grade. During the initiative announcement on October 23, 2018, NCFL President and Founder Sharon Darling explains the importance of parents speaking with their children from birth. Say & Play with Words will equip parents with free vocabulary-building tips and activities – found on SayandPlaywithWords.org – to use at home or on the go; build upon NCFL’s existing Family Learning efforts underway in Louisville; and, will provide training for professionals working with children and families. PNC's Senior Vice President, Director of Client and Community Relations Mike Moll talks with a family participating in an NCFL Family Learning program. Say & Play with Words will build upon NCFL’s existing Family Learning efforts underway in Louisville. “Kids’ Spaces” will launch in area businesses later this year as a way to meet families where they gather. Local businesses can volunteer to host a “Kids’ Space,” which will provide easy access to resources for their customers. Examples of potential locations include the waiting room of a doctor’s office, nail salon, tire shop, barber shop, etc. – anywhere parents and children may spend time. 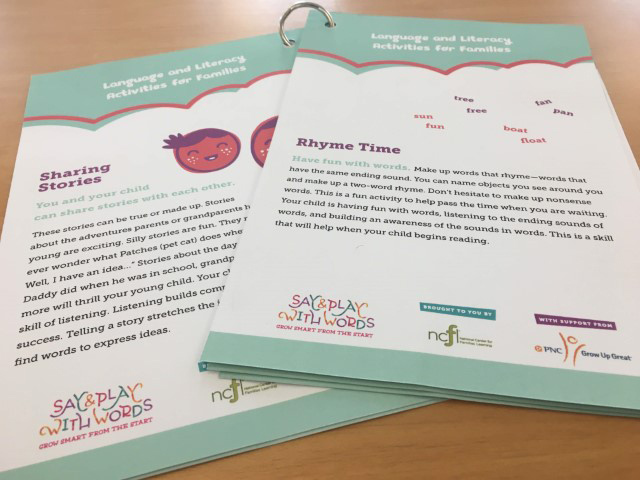 Businesses will be given Say & Play with Words signage and activity sheets that encourage young children and families to explore new words together. In addition, parents in NCFL Family Learning programs will be empowered as leaders in their communities by serving as Say & Play ambassadors. 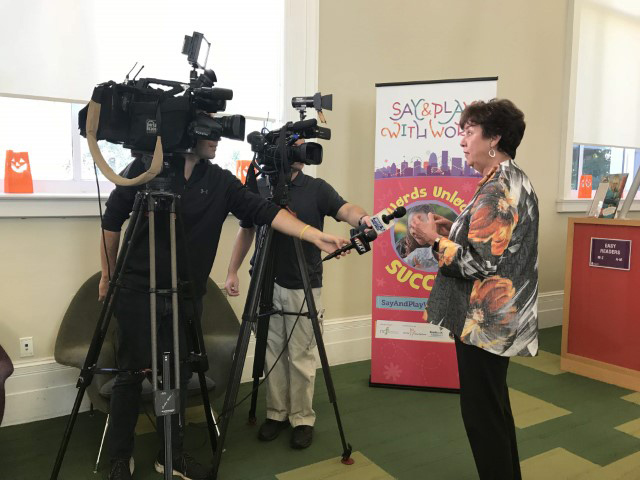 Development and outreach for Say & Play with Words Louisville is supported by Louisville Metro Government, Lift a Life Foundation and Ready for K Alliance. The PNC Foundation’s $250,000 grant supports development and outreach, as well as implementation at existing NCFL Family Learning sites. Say & Play with Words Louisville will replicate the success of a similar program in Detroit, also supported by PNC. Since 2014, more than 3,000 Detroit caregivers have received vocabulary-building resources each week in English and Spanish and their children heard 6,000 more words per week, on average. Say & Play with Words Detroit engaged nearly 100 businesses and trained staff at nearly 400 child care providers. Follow Say & Play with Words Louisville on Facebook or visit SayandPlaywithWords.org for more information. My program is officially recognized as a Family Literacy program under the AEFLA requirements. I would like to know how to gain access to the Say & Play With Words materials. Thanks for reaching out, Diana! Resources can be accessed digitally here: http://www.sayandplaywithwords.org/louisville/. If you'd like printed materials, we can put you in touch with the right NCFL staff person. Please email us at info@familieslearning.org. How wonderful! With an intervention like Say and Play with Words coupled with total commitment by all involved there can only be win-win: teachers, communities, parents, but especially those children who need such help. Can NCFL assist me to get copies to adapt this Say and Play with Words in Ghana to help children with similar needs to become all-round achievers since the foundation stage of education is critical? Thank you for your interest and for reaching out, Ewura-Abena. At this time, our place-based work takes place solely in the United States. We hope you are able to utilize some of our online resources in the future: http://www.sayandplaywithwords.org/. Take care!